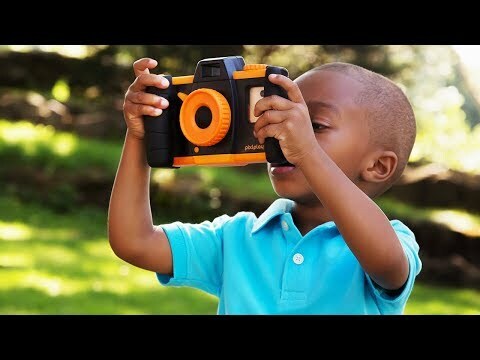 Budding photographers can get snap-happy with this smartphone case that turns the phone into a camera just for kids. The classic point-and-shoot design protects the phone while letting kids access its camera function. 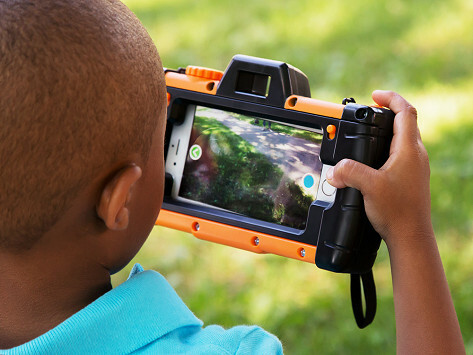 Plug the phone into the case and connect to the app, and let the little photogs take it from there—they can even edit shots and explore photography-themed play, too. Dimensions: 7" x 4.5" x 2.68"
Maximum phone dimensions: 5.59" x 2.95" x 0.37"
Minimum phone dimensions: 4.54" x 2.31" x 0.26"
She only 2 1/2 but loves to act like she taking pictures with her mom's camera. She loves this and she learned how to use it already. Kids will be delighted to be on the other side of the camera, and thoroughly engaged with the world of photography opened up to them.